As he received four bags of chips, we split the review into two parts. For our first sampling session, we paired the Montreal Steak Spice with Sixpoint Brewery’s The Crisp, a German style Pilsner brewed in New York while the Pink Himalayan Salt was paired with Maine Beer Company’s Peeper Ale, an American Pale Ale. For our second sampling session, we paired the Spicy Srirachup with Bissell Brothers LUX Rye Ale while the Maple Bacon was paired with Samuel Smith’s Organic Chocolate Stout. Limpd: Great crunch with a good bit of ketchup sweetness and a sharp Sriracha bite that carries through to a long, spicy finish. G-LO: Super crisp and crunchy. A nice balance of spice from the Sriracha, sweetness from the ketchup and salt from the, ah, salt (that’s the ticket!). Also, getting a touch of vinegar. It’s quite delicious and I like the bit of residual heat in the aftertaste. Limpd: First off, let me say that this is a really good beer and I am quite grateful that G-LO participates in a beer barter economy. With the chips, the ketchup sweetness is a bit reduced while the Sriracha finish is kicked up a notch. This pairing came with my better half’s seal of approval as she indicated that she loves the chips and loves the beer with the chips. The Sriracha may have been too much for the urchins as they did not get the benefit of a quality beer to mellow the spice. These chips are hot, hot, hot! And, good, good, good! G-LO: This might be the best combo to date. The beer’s subtle bitterness and the light rye spice both mellows and complements the sweet/spicy/salty/tart flavors of the chip. Limpd: A big blast of maple right out of the bag. Not as crunchy as the Srirachups but still a respectable crunch. Nice Maple flavor with a lingering meaty flavor. I think I like this one the best out of the four we tried. Judging by the urchins’ reaction, this was their favorite as well since they practically dove into the bag. G-LO: I went into this one with a bit of trepidation (Editor’s note: like G-LO knows what trepidation means. Must be from his “word of the day” toilet paper). A sweet chip with bacon? Kinda weird. But then I tried it and actually liked it. Not overly sweet, not overly bacony. Just a crunchy, lightly sweet chip with a hint of bacon. Yum! Limpd: The chocolate stout was my idea and I loves me some Samuel Smith’s. I thought chocolate chips, bacon and maple syrup … a breakfast bonanza! But it was almost too sweet and maybe not the best combination of a great beer and a great chip. I moved on to a Samuel Smith Imperial Stout and found the results to be far more complementary. Like a cup of coffee with breakfast. And I don’t even like coffee! G-LO: This combo may have been the oddest of all. It’s almost as if I’m eating chocolate chip potato pancakes with a side of bacon and a chocolate egg cream to wash it all down. Odd, yet kinda fun. Not my favorite combo but definitely intriguing. Limpd: As with our first session, I was very pleased with the balance of flavors and the crunch. 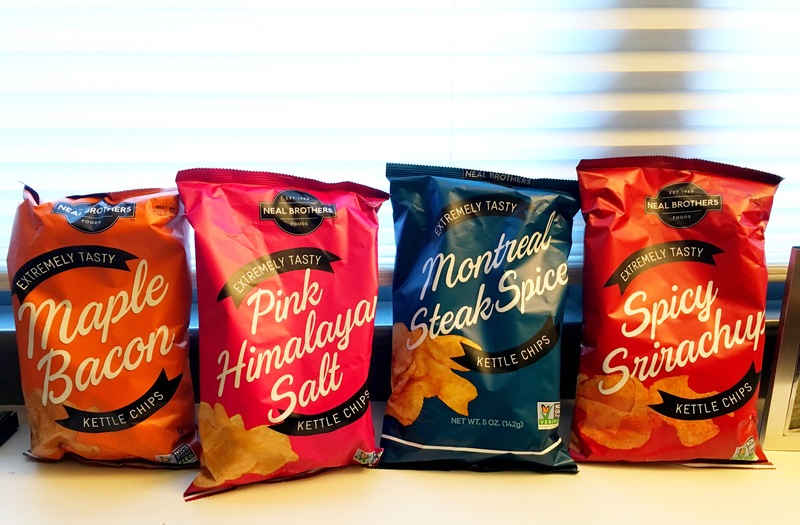 I would definitely try these again, and will look for the regular kettle chips, as well as a salt & vinegar flavor. One can never have too many snacks in the house, after all. Many thanks to Kelly French and Neal Brothers for the samples! Smirnoff Ice Electric Flavors: Gatorade For Grown-Ups?